CEU hours credit towards Yoga Bloom 200-Hour, 300-Hour and 1000-Hour Preventative & Therapeutic Yoga Training Program with completed assignments and practicum. Modules focus on mentorship and personal development as a teacher and practitioner; students are required to complete all hours and assignments. This in-depth specialty program breaks down theory, practice and implementation. 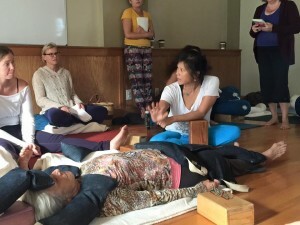 Learn how to take your students through a deep restorative practice with Restorative Yoga Teacher Training from a pioneer in the field of Yoga Therapy. This is a 100-Hour program consisting of Modules of 20 Hours each. Yoga Bloom 100-Hr Preventive & Restorative Yoga Certification is an intense curriculum of how to understand and address the practical and real life experience of work and family stressors. Restorative Yoga provides deep physical and subtle emotional support, so it is the perfect antidote for anyone who is overly busy, stressed, exhausted, depleted or feeling disconnected from themselves. This is designed to refine your teaching, or as a way to deepen your own personal experience. Learn the scientific and somatic language of the body and apply this knowledge through practical experience. We will work with three key elements: Technique, Sequence & Timing. Modules are held in 2-Day and 3-Day format. October session begins Saturday Oct 6 9:30a and ends at 4:00p on Monday Oct 8. All sessions will be held in Cora’s private yoga studios in East Hampton, NY. Classroom is limited to 5 attendees to promote a positive collaborative learning experience in an intimate, safe environment.